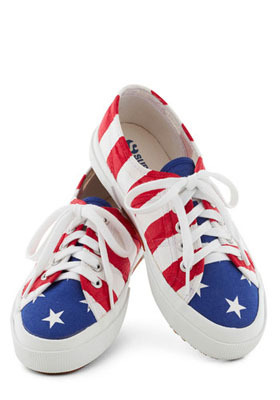 It’s time to celebrate the Fourth of July once again with fun and fancy patriotic-colored footwear. This party pump above is a platform stiletto and is about as independent in style as it gets. We’re not sure just how tall the heel is but it appears to be at least 4 inches. The price is not too high, though, if you are in the mood for a stilt-like look. We’ve seen it as low as $37.43! If it’s just simple tennis shoes you are searching for and want to have the holiday look, you may be interested in these Grand Bold Flag Sneakers. Above all, they do look like they would give your feet a nice break and get you to where you are going with style and ease. 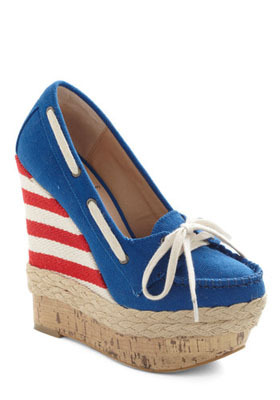 And for your wedgie lovers, you may think you haven’t spotted just the patriotic shoe for you. We came across this little number that we think is also bold and special. The ahoy-platform as it’s called, climbs 2.75 inches and the wedge 6. See what you think although we read (and see) that these may not be the easiest to walk on. If you’re looking for pure comfort, our vote would be the Uncle Sam sneakers. Filed Under: Fun Stuff Tagged With: 4th of July Shoes, 4th of July Shoes for Women, Fancy Fourth of July Footwear, Fourth Footwear, Fourth of July Footwear, Fourth of July Shoes, Grand Bold Flag Sneakers, Stars and Stripes Shoes.